This little piece of art makes nary a dent in the waste materials I find in my life. It does, however, make me aware of the 'stuff ' around me that impacts the environment in a negative way. The first Earth Day was Wednesday, April 22, 1970. The following Saturday, my Girl Scout troop and I spent the day cleaning up the local park. This is one of the strongest memories the girls have of scouting, and I believe it set us all on a path to be better Earth citizens. 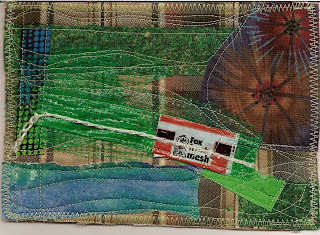 a mesh plastic bag that used to have limes (it melted on the postcard above, you can see the remnants as a very cool grid-ish pattern on the left side) all on fusible batting scraps. I've really enjoyed seeing what everyone else created for this challenge. I wanted my postcard to not only be from recycled materials but to present visually an Earth Day theme, so I chose Please Recycle! Litter is very harmful to wildlife. Birds and fish have been killed by eating or getting trapped in litter. The gray fish body was made from a scrap from a 3D project and was already quilted in a circular pattern that looked to me like fish scales (sort of). 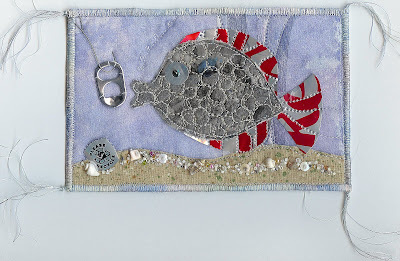 The fins, tail, sequin around the eye, pop top and Please Recycle logo as well as the vertical pieces behind the fish are from a Diet Coke can that I cut up and stitched onto the project. The Timtex postcard base was left over from a previous postcard project. The background is cut from a sheer that I used to mop up all my leftover paint in a painting workshop. The sand is a scrap from a strip pieced quilt project years old. The hook is a Christmas tree ornament hook. (Funny story--I was looking for a leftover hook--usually they turn up all over the house for months after the holidays. Could not find a one, thought I was going to have to dig out the Christmas decorations. I bumped a pile of fabric on a table in the sewing "studio" when an ornament that was behind the fabric fell to the floor, hook attached!) Beads and thread were in my stash. Thanks for having this challenge, it was a blast, and I had never stitched metal from soda cans before, so I learned from it! Love what everyone else has done! This is a post card I made a couple of years ago. The background has lots of recycled stuff... The background an old printed postcard,over-stamped, silk flower, leaves, fabric scraps, buttons, beads,sequins, crystals,gold Christmas tinsel, machine and hand stitches. The edges are finished with decorative stitches and fuzzy yarn. When sending swaps I always mailed one to myself... Celebrate Pack-Rat Day relates well to the Green Postcard challenge. I used bits of fabrics from my trash basket (that never gets dumped) to create a multi-colored piece large enough to cut my heart from. I had an old postcard back that I had left from a trade about 2 years ago. I thought it needed some sparkle so I added the crystals which I bought at Quilt Festival in Chicago 3 years ago. I think I could create art for sometime without having to go to the store to purchase more supplies (but what fun would that be?). Actually in the last 2.5 years I have been using supplies that I have had since moving to Michigan, The art supplie stores are very few and far between here. I can't wait to move back to Omaha this summer! The postcard theme is "Someone To Watch Over Me", meaning we all need to be alert and watchful in protecting our earth's environment. 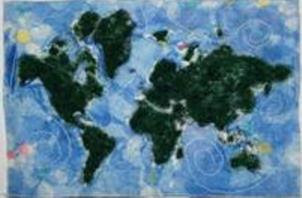 The background is an image of the eyes of peacock feathers and one pair of human eyes with swarovski crystals, set to "Watch over the earth to help protect". The trim is embellished with tiny flower seeds which is a symbol for re-seeding the earth's forests. This postcard image - recycled self - was made by capturing the output of my shredder under a sheer organza overlay. The green background is a nod to the challenge. I managed to use up two bobbins of old thread and a spool of green thread in the making of this piece. I haven't quite finished it yet - still needs a stitched edge but thought I would post before the deadline. 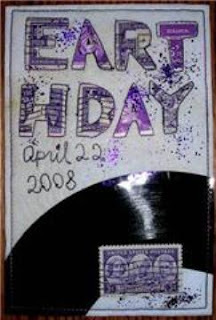 This postcard is made from 100% "recycled" materials. The fruit was stamped using a pomegranate that was on it's way to the compost. The fabric came from a piece in a swatch book and the yarn trim was taken from an old sweater that had outlived it's usefulness in that form and is currently being reworked into a scarf. 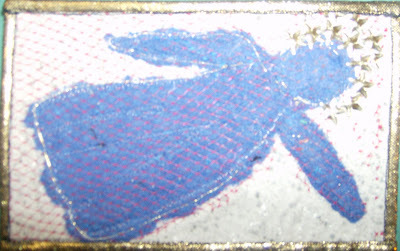 The gold thread was picked from a holiday ornament. This challenge was great fun and an excellent demonstration on using "old" to create "new". Well, I wanted to do something with my old catalogs and I rediscovered my book on origami quilts. 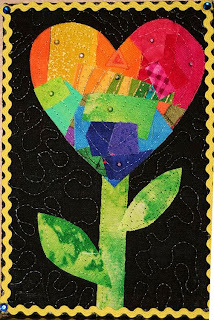 So I cut up my Nordstrom pages and created this mini paper quilt on a fabric background. I also used some wooden buttons from my stash to attach the origami to the background. Still need to finish the edges and do some quilting but thought I'd post. Which one do you like better? Working on another one (Shards of a life ) using my shredder output and will post soon. Well I was humming right along on my design when disaster struck!! My sewing machine is broken. I was having issues and decided to clean it out, oil etc. When I put everything back together, it didn't fit!! My husband is working on it in his spare time. So I am posting my progress photo. I had another piece I was working on and trimmed it to size. When I put the scraps on a pile, I noticed that it made a nice little design. I started playing with all the pieces and ended up with this. The brown "fencing" is from my potato bag. I want to add some grasses in the bottom so when my sewing machine is fixed, I will do that, trim to size and add my border. My inspiration was partly from the scraps and from a recent trip out west. I recycled some dryer lint, covered it with a piece of an onion sack and (unfortunately) put it on a piece of fabric stuck with heat-n-bond ultra. When I tried sewing my needle continually clogged with glue from the heat-n-bond. I wanted to do all the stitching with metallic gold, but the needle clogged so much that I finally gave up and bonded some gold stars leftover from another project. Backing and bonding were also left-over bits. After trying many options, decided on this for the final card. 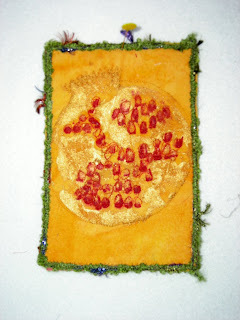 I really liked it just plainly mounted to felt ground. Entitled Penguin Parade, weird I know, after the project that begat the scraps from which this was done. I like it. Don't ask me why, but after pre-washing my fabrics, I always cut off the tangled "thread blobs" and throw them into a bag. Never knew what I was going to do with them until the Green Post Card Challenge. Ah ha! I created a miniature landscape by arranging my thread blobs onto a piece of batting. I then sprinkled with a tiny bit of Bonash and topped with a piece of tulle. I free motion quilted, backed with a piece of card stock and zigzagged the edges. I made this postcard using a fabric swatch from a fabric store sample book and half a dried up pomegranate that was on the way to the compost pile. 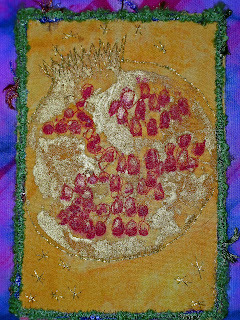 After stamping with gold paint and touching up the "berries" with red paint and thread it's almost finished. A bit more stitching on the surface..
Well I've finally gotten around to posting the photos of the beginning background for my postcard. I had posted earlier about the construction of the background (see below) out of plastic tablecloth scraps that I make patterns from. 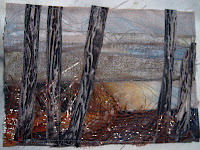 I then stamped and embossed and stitched and inked until I was really unhappy with it. I thought it was ruined until I cut a 4x6 template and auditioned portions and found that I did like parts. So they were trimmed. They will now be mounted to felt and embellished with hand painted wool roving. I always think I'm a good recycler. However, when I see those GREAT grocery bags I know I have to think a lot greener. At the moment I'm deep into a quilt show project. I'm sure to have little scraps just right for a post card. What else? HMMM. the best part is I'm able to use all this funky fabric that has been just sitting around & taking up space with no real purpose...and now it is being re-cycled/re-purposed/reused !!!!!! I love it !!!! I've been playing around in the studio with some old plastic table cloth scraps that I use to make patterns for costumes. I had large pieces on the table and one of them fell on the fold in an accordion fan fold type pattern....I inserted some strips of fabric that I had trimmed from another project and I was off. I was gathering things up for garbage day when I looked at the shredded output of my life in the shredder basket. I'm thinking of making a card using these shards and calling it fragments of my life or something like that. Last night I reviewed a book I acquired recently called Creative Recycling in Embroidery and got inspired. The artists integrated everything from washed up coca cola cans to metal, wood, and candy wrappers into their art with amazing results. This is a British publication and it's challenging at times to understand their terminology for things (e.g., aquafilm vs. water soluble fabric). Fortunately the book has a glossary. If you can review a copy of this book it is worth a look. I'm excited to join the "green" challenge. Last night I cleaned out my refrigerator and found an ear of corn, a pomegranate, and an apple that needed to be tossed. Instead I cut them up and will let them dry a bit before recycling them into dye/paint stamps. Haven't tried this before and I'm looking forward to the results! Gretchen Jolles in warm and sunny Jacksonville. 2) Postcard size is 4" x 6" . The design can be either vertical or horizontal. 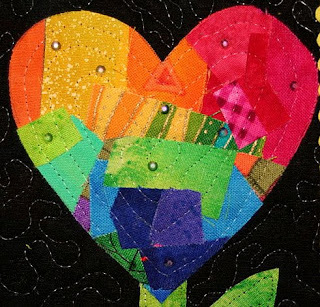 In the February/March issue of Quilting Arts Magazine you will find an article by Natalya Aikens on eco-friendly journal quilting techniques. She has suggestions for recycling many materials. Her end results are lovely and inspirational. 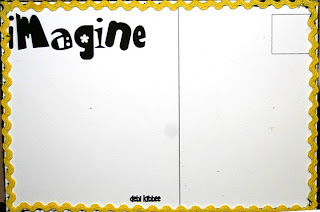 All members of the challenge should have received an invitation to be an author of the site. That means you can post directly to the blog rather than comment on an existing entry(of course you can do that as well). I haven't actually set up a blog this way before so I would like to ask that someone give it a try and see if it works! You could also direct someone to look at your own blog site for progress if you like. As for me, I've been holding onto this incredibly beautiful packing material that looks like scales on a fish. I want to use it in this piece somehow but haven't quite decided what the design will be. 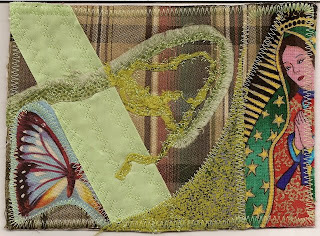 This challenge was originally posted to the art quilt mailing list but is open to all who are interested in participating. 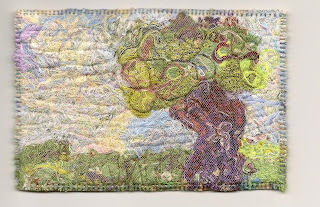 The objective is to make a fiber postcard from materials on hand that makes a statement about the environment. Feel free to reuse any objects as long as part of the work is fiber. At some point we may find a venue for exhibiting the work. 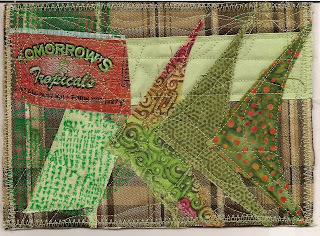 To be added to the list of participants please send a note to needlescape@hotmail.com with the word green in the subject. Please post your progress and any other ideas you have for the challenge.